Ha, ha! Up until today, I have remained undecided whom to vote for President. Searching for a photo to adorn this post, I came across this one; it was perfect. It highlights the chorus of ridicule I’ve heard aimed lately at the undecided ‘wishywashers’ among us. I am tempted to return the favor. However, examining this from a symptomatic point of view instead will get me farther, I feel. It is easy to see how tribal instincts are clearly running the show here. Which tribe are you on, the Democratic or the Republican? If you can’t decide, well, then you must not be one of ‘us’. If not one of us, then you are “UN-AMERICAN”. This kind of groupthink is endemic, although usually not as pigheaded and ignorant as this sign portrays. 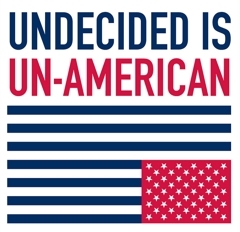 No, often the undecided are just scoffed at as fools who can’t make up their mind about anything, from choosing between chocolate or vanilla to—heaven forbid—choosing between Romney or Obama. The ironic truth of the matter is that many of the people who so quickly decide on which team they support (often unquestioningly) also wish the two teams would cooperate enough to make government function efficiently. That is a perfect example of wanting to have it both ways! On one hand, we give Congress a bottom-of-the-barrel approval rating; on the other hand—through our ‘blind’ partisan choices—we keep voting for those most likely to ensure we’ll have a dysfunctional Congress. When a politician is certain he has your vote, what is his incentive to be as honest or competent as possible? When we decide between alternatives, what actually drives that decision? Is it our so called free will that chooses, or is it our emotional bias rooted in need and fear that chooses? All evidence points to the latter. For example, take standing up to fetch a glass of water; I just did that because I was thirsty and wanted a glass of water. My need for water ‘chose’, not free will. The most I did was observe and record the experience here just now. Any thirsty animal would have done the same; only a human would also observe and record the experience. The only time such a mundane decision becomes worthy of ridicule is when I can’t decide if I want bottled or tap water, chilled or flavored water, or some other petty option at which any thirsty nomad in the Sahara could justifiably scoff. However, being undecided about who to vote for isn’t a petty option. That said, options, petty or important, are about desire. Challenging desire is where the journey to wise decisions begins: Taking this, the wise person desires non desire. Hand in hand with this goes being as undecided as possible, weighing what passes for facts as best we can gather them, and thinking outside the box in which each side wants to trap us using our own desires as bait. Finally, we can hope to be as tentative as if fording a river in winter; as if like in fear of neighbors in our final decision. I suspect that if the polls were saying that 50-75% of the country was undecided about for whom to vote, politicians would have to either be more honest and mature, or step down and make way for those who were so qualified. As I’ve said before, we get the kind of government we earn and deserve. Government can’t possibly be more mature and responsible than the masses it governs… government is us. Yes, this is a sobering picture, yet hope is on the distant horizon. See, Don’t trust anyone under 60, and Core Issues of Human Nature: Ethics for some of the silver linings I see. I finally decided, filled out my absentee ballot, and will hand it in tomorrow. Up until now, I just didn’t know which way to go. I like and dislike some aspects of both Romney and Obama. Also, as you can see, I don’t expect much to change. What happens in Congress matters most. There is a chance that Romney will actually be more adept at getting the opposing forces in Congress to cooperate more. That has proven to be Obama’s weak point; serving the lower position just isn’t in his nature… yet anyway. So, I voted for the Libertarian chap, and a few other candidates that are certain to lose. If loads of other people ‘threw’ their vote away in such a way, our politics would reflect that in mature ways, or so I’m guessing. As long as people commit themselves to tribes so robotically, we can expect politics to be more like that of a children’s playground than the grownup ideal for which we dream. Great blog. I’ve thoroughly enjoyed these latest posts on politics. The Tao Te Ching is in many ways an ancient ancestor of ‘Western’ libertarianism and I use it for guidance when approaching political issues. Mainly because these teachings pre-date the concepts of ‘Capitalism’ and ‘Socialism’ which are almost always included in a debate on the merits of libertarian philosophy and it’s application to public policy. Through the TTC, we can discuss the idea of the ‘Government’ without getting bogged down into the tribe mentality you mention in the post over whether State-run capitalism or State-run socialism is more beneficial, we can say there is a Middle Way approach to either, and the more human intervention and manipulation in either system, the farther you travel from the center. I know this is overly-simplified, but how great of a case can you make for something with 250 characters?